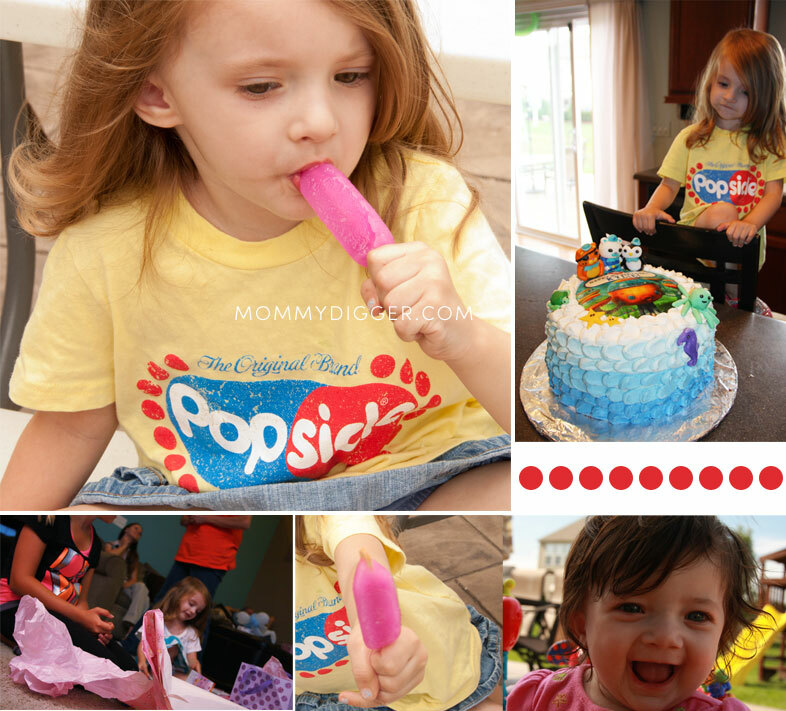 My Pinky turned 3 just a few weeks ago and to help celebrate we threw a Popsicle Pop-Up party to celebrate! Her birthday falls just a couple weeks before the official end of Summer so it was a great way to send off a great season with the best cool summer treat there is, Popsicle! There were lots of yummy choices including – Jolly Ranchers, Mighty Minis and (one of my new favorites) Hello Kitty Popsicle’s! We had lots of neighbors stop by and visit and grab a Popsicle to enjoy on one of our last warm days and it was fun to meet some of our neighbors that I hadn’t met before! While our party did get rained out unfortunately we didn’t let it ruin our fun and took it inside. While we did enjoy some birthday cake as well I think the Popsicles were the biggest hit, they were gone so quickly and I kept replenishing them! We had such a good time and made some wonderful memories, everyone really loved her Octonauts Popsicle Party! It was a great way to spend time together and Popsicles were the perfect and affordable treat to say goodbye to summer. I think we may have a new tradition! To see all the yummy Popsicle treats visit Popsicle website or visit Popsicle on Facebook to join the conversation! Summer is my favorite because of all the outdoor music festivals. I love to eat watermelon and go to the pool during the summer. 🙂 My favorite season is the fall. What I like most about summer is the warm weather, the smell of fresh cut lawns and grilling outside. Summer has always been my favorite season. Thanks for the giveaway…love summer; was able to take a scuba certification class with my daughter this past summer, had a blast.